Your Bosch dishwasher doesn’t dissolve the tablet or soap fully? Here’s the fix! Finally! In this post I’ll discuss how I fixed my Bosch dishwasher. This one at the right is actually my second Bosch, the first one was identical and lasted only about three years. Is your dishwasher driving you nuts? I was about to throw it out the window like its predecessor because patience is low these days. Symptom #1: the tablet gets stuck in the handle area shown as A, see picture at the right. and that the strainer filter at the bottom is completely clean. This was the cause of death of my previous Bosch dishwasher. The filter needs to be religiously cleaned once a month or the pump will die prematurely. As you can see in the in the picture above, arrow B points to the gray pipe which runs from the bottom pump along the depth of the dishwasher, and then up. The reason why the tablet was not dissolving was that the pipe loosened up and very little water made its way up. The tablet was getting stuck at “A” shown above because hardly any water was sprayed around at the top. You need to push the pipe all the way down until you hear a “click”. Once in the correct position proceed as usual and load the dirtiest dishes you can find. And since you made your hands dirty you might as well use the opportunity and clean the strainer filter once again, just in case. 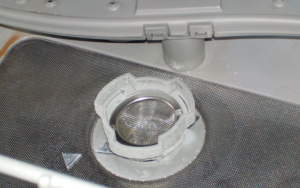 Reduced water flow due to dirty filters may also impact water pressure inside the dishwasher, which could also lead to tablets and powder not dissolving. If fix #1 didn’t solve the problem to 100%, there is another fix: buy liquid dishwasher detergent, i.e. gel. I tried all brands and they all work well. You may have to use a little more gel but it works way better than powder or tablets. The cleaning power of the gel will depend on quantity and brand used. But as long as we rinse the dishes before placing them into the dishwasher I have to say it works well. Thank You for Visiting this Blog…hopefully this Fixed the Problem! Since you found this page helpful, please share on Facebook or link to it so that other Bosch “victims” like us can find this solution easier. Google prefers pages with many links (not necessarily the ones that are actually helpful), so your link-love is always appreciated! If you found another cause or solution to the problem, please email me to add it to the article so we can help others, too! Are You Also Seeing E24 E25 Errors? 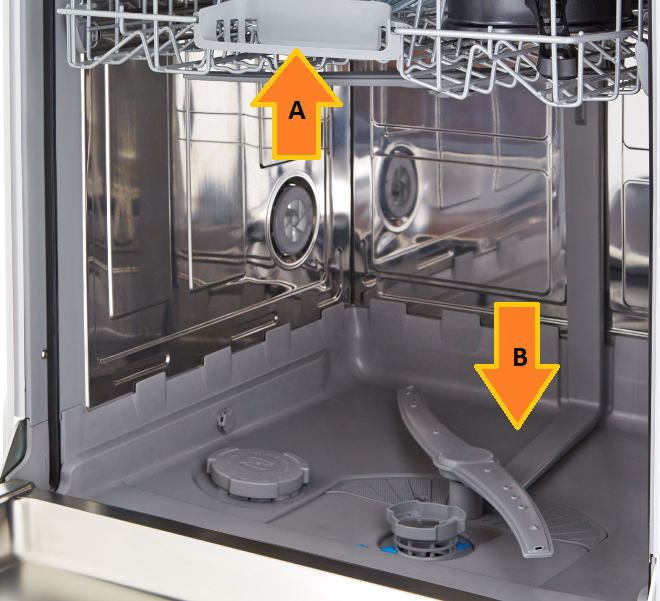 If you BOSCH dishwasher spits out E24 or E24 errors, you definitely want to read this how-to fix article. Much of my time focuses on Hyper-V backup. If you work on Windows Server a lot, you may want to check it out. Genius! Am old lady (74). Have year old Bosch dishwasher with exact problem – soap pods catches in handle of top rack. With this excellent explanation and the picture to help, I was able to make the repair myself – in less than a minute. Had to feel around a bit because the spray arm visually covers the pipe connection. Mine had moved completely away from the incoming water pipe so no water at all was going to the top spray arm. Thank you so much for saving me a service call and repair charge for what amounts to something so simple. I agree about the pods. Think I will go back to the gel. First time it happened today. Washed same dishes 4 times with same pod not dissolved in exact place from the picture. After 4th time, I knew it’s a water issue, but I know I wouldn’t be able to figure out that “flaw” from the article. First Google search, first link and one minute later I made my wife happy lol Thank you for helping. This is Bosch and maybe a year old…Too early for problems like that. Another cause of this annoying problem is cracking of the lower spray arm. Trying to see if the pipe was in place, I noticed that the side of the arm was cracked. Replacing it cost $28 in parts, and it just snaps in. Fixed the problem. I’m an appliance repair technician and I disagree that you need to pre wash the dishes…soaps nowadays have eliminated the phosphates due to EPA mandates. They use a combination of enzymes to clean. It’s IMPERATIVE the soap has some food protein to work with or you’ll get a scummy build up in the machine that will stink, lower performance, and shorten the life of the machine. And if you use gel, you must shake the container first to recombine the detergent, as it can seperate while sitting on the shelf. Thank you George for your sharing your insights! I had no idea the gel should be shaken before use. The thing with the build up appears to be an issue indeed, especially inside the pump. I use white vinegar every now and then over night to break it up… The sanitize function helps to keep the interior odor free. Thanks, Love it when it’s something easy and when someone explains the fix in a helpful way! Keep up the good work. Had same issue but also noticed that dishes on lower rack could also block the water flow, i.e. a big glass tray covered the area below where water would be forced up to dissolve the pod. Have to turn these on the side or put on the top rack. I have an 8 year old Bosch DW, model SHV68T53UC, and the soap cup door fails to open. It started out happening only once every 4 washes or so, so I figured it was soap and sediment buildup and not the soap mechanism or the electronics controlling it, but now it seems to not open at all. Anyone have a quick way to get to the culprit here as I don’t want to buy parts I don’t need. I always use liquid detergent. Recently have this problem, I checked the filter and the B point as you said. The pipe is firm and the filter I clean. Is that possible the water has problem? Mine seems can’t remove the bottom panel and check the pump. Hmmm, I would check water temperature. It could also be there is something stuck inside the pipe or inside the pump and thereby reducing flow. In my experience now with liquid detergent, it tends to create a sludge, which is probably worse than the dry soap not dissolving, as it is hard to remove from the filter and pump area. I use vinegar over night, fill the filter and pump area and let it sit for many hours. On several occasions the issue was caused by a tiny salad leaf in the pump suction area. Finish tablet frequently didn’t dissolve in my Bosch handle/basket. Simple solution, removed the handle (it unclipped easily) so tablet falls to bottom of machine (didn’t just chuck it in at beginning as pre rinse would just wash it away!) changed to Fairy Platinum powder/gel combination. Result, lovely shiny, clean dishes just like my very first dishwasher produced and much better drying. Looks like the detergent door doesn’t open after 15 minutes of start. I tried open the door and manually open open the detergent door after 1 minutes of start, still residue in the detergent house. Don’t know what’s the problem.